A little-known comedy series will finally see the light of day later this week. Greg Fleet’s sitcom Die On Your Feet, which stars some very familiar named, will air on ONE from 10:30pm Thursday. 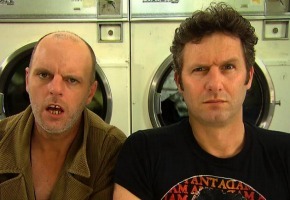 It stars Adam Hills in his first ever dramatic role, alongside Steven Gates, Alan Brough, Corinne Grant and Fleet. It also features Bill Hunter in his last TV role. Directed by the great Ted Robinson (Good News Week) the project was shot over 11 weeks in 2010 but first emerged as a play in 2005. “It’s British in style, with no laugh track and shot on location. They are five stand-up comedians playing characters, not themselves, trying to make a go of it in the Melbourne Comedy Festival,” a source told TV Tonight. I just saw this. Indeed it is, erm, extraordinary. Who knew Mr Squeaky Clean Adam Hills was capable of such profanity. And such bad acting. No wonder it ended up on a digital channel. I haven’t laughed so hard in a long time. Not because it’s funny (it’s not), but because of its sheer ineptitude. It falls into the category of So Bad It’s Good. Obviously the budget did not extend to hiring a sound guy. Or a script editor. Or anyone else with producing credentials. I am still laughing at Hills’ line (to Corinne Grant, in pure soap opera tone), “I miss the way we made love.” Can’t wait for the next episode. As someone who has seen the first couple of episodes I really urge everyone to tune in to at least the first one. It is extraordinary and I’ll leave it at that.